Twiiter and Facebook, Social network tips tricks, Spy on Facebook, Hide messages, Trace train, Send large files, Book IRCTC ticket online and find IP address of emails, Proxy and browse anonymous, Online apps. Looking for Top 10 Best Websites To Watch Online Movies For Free in 2015? Then you are at the right place, Here i will provide you a list of top 10 websites where you can watch movies online for free without spending any money. There are several online movie streaming websites available for both paid and free, but these top 10 best websites I’m going to list below are the updated list for 2014.Also know how to install JARVIS iron man theme on your windows computer. Note: I’m not providing any links here to download new movies, i‘m just providing list of websites from which you can either download or watch movie online for free. 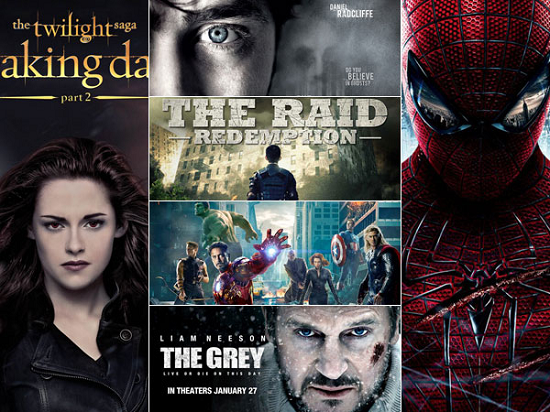 The best movie site of 2014 is topMovies.se because it provides the user a large collection of movies including new and old. Integrated search options allow you to search any movies that you want to watch online for free. Moviescout.tv provides movies not only for free but any legal downloads can be done by paying a few bucks. They have cheap and lowest price for online movies and their collection of movies and TV shows are enormous. They have a good community on that website which strengthens the websites’ fame and the website also provide useful information and links about the actors,languages and storyline of the movie. Megashare contains a collection of almost every movie, including TV shows on its database. The best feature of this website is that you can watch movies online without any registration or downloading any players. The only disadvantage of this website is that you cannot stream the movies in HD. Though it’s a best website to watch any movies online, it’s a big no-no for the children under 18. You might have to install the XVID player in your browser to play the movies for free. It provides a complete experience with 3D quality movies, including 18+ movies. The Los Movies website allows you to stream online movie for free on the same page which means you can watch the movie without redirecting to any other page or filling up any surveys. Movies in Los Movies can also be watched from mobile devices as well and that’s not only the advantage, but also you don’t need any membership to sign for watching your favorite movies. YouTube is one of the best website that’s available on the internet. Not only movies, but you can watch any video on YouTube such as TV shows, Trailers, Comedy videos, Video Songs and much more. YouTube is absolutely free and it can stream HD videos too. Sadly HULU is only available for US users. Most popular shows, television series and movies can be watched online on HULU for free. It’s free for one month to try and you can get a membership from them for just 8$. Alluc.to has a wide variety of collections of movies and it’s one among the old movie portal which are available today on the internet. It was started in 2006 and their database also includes TV shows, serials, cartoons and adult contents. If you are familiar with Film.fm then you mush have known about Movli.com because both are one and the same. Film.fm has been redirected to Movli.com recently and it provides better search results by filtering the actors starred in the movie. Nyoo.tv is especially for all the desi Bollywood fans. This website contains Bollywood movies and some top TV shows from India as well. These are the best top-10 websites to watch online movies for free in 2015 and if i had missed any good website then please let me know it in the comment section. This entry was posted in internet on Jan 21, 2015 by Rajesh. We have selected the best websites to listen to free music online in this article in which you only need an Internet connection of a certain quality, enabling you to hear the songs in MP3 quality at least. Almost all catalogs are extremely spacious and can be enjoyed openly. Many also offer paid versions (subscriptions) without limitation to dive into the world of music background or from mobile devices to take music anywhere. You can almost hear any songs online with multi-languages support like Hindi, Tamil, Telugu and many other Indian and International languages as well.Also read : Top 10 websites to watch online movies for free. It is a real phenomenon that has revolutionized the world of music making that many people forget the shock and shopping or having to use your computer to store your songs. The way to use it is to download a small software that acts as a music player while it is connected. 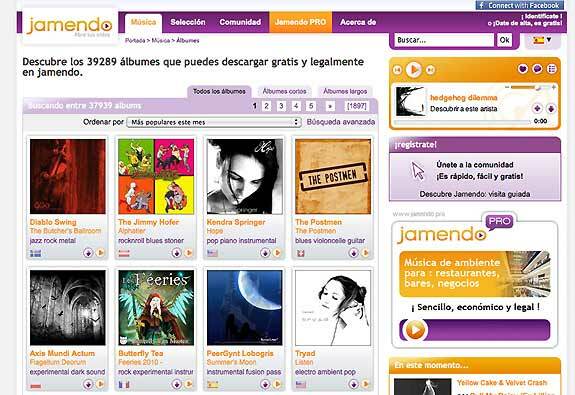 The catalog of about 10 million songs, plus many international hits including Spanish music; hearing can be arranged by artists, styles or popularity. It has a “radio” for styles and you can sort the search results by different criteria. Besides all this, Spotify has versions for mobile devices (iPhone, Android and Symbian) and should not be connected also allows download songs to hear them offline. It can be used for a free account, whose side effects between songs sometimes heard commercials or in the paid version by subscription: 5 euros per month with unlimited songs or 10 euros per month for the version allowing downloads, mobile version and high quality. It is one of the most powerful services with more than 22 million songs . With one click you can switch to the version in Castilian and from the browser to access the wide range that includes many songs in Spanish. 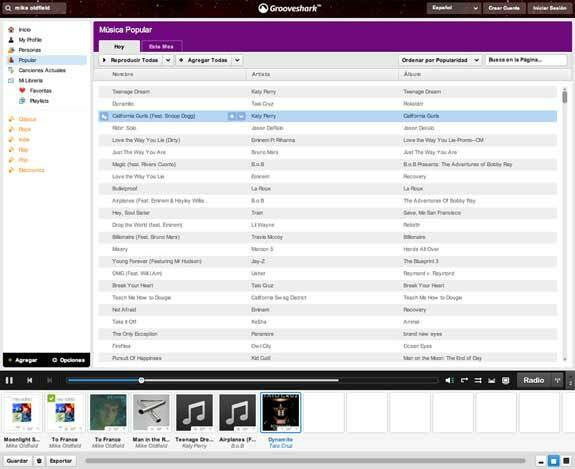 With a simple interface, a few clicks are enough in order to create playlists in which to save favorite songs. The system also has a section called ‘Popular’ where you can see the songs favorite fashion community. The radio works by offering an advanced recommendations system , so that once the system knows what songs we like will offer similar you’ve heard people with similar tastes. GrooveShark is offered in two versions: free ads including occasionally and VIP version for about 3 euros per month, no ads or restrictions. It was one of the first online music services offered songs and full MP3 quality; since then it has remained in the panorama improving its interface and the options offered. One of its best features is the musical recommender: from some names of artists is capable of generating a “personalized radio” with songs that are like us. The songs on the radio can be heard in full, and now allows you to test up to 30 free songs (the paid version costs 3 euros per month and is free of advertising). 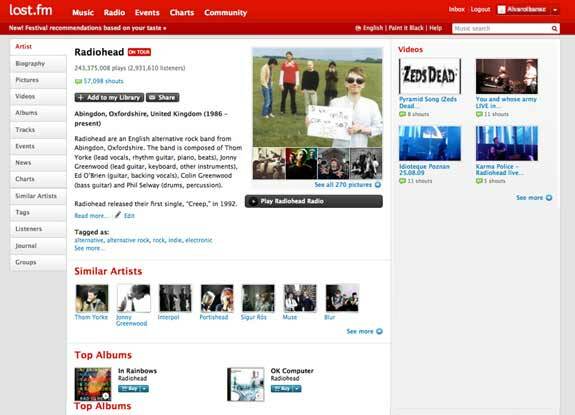 As in almost all of these services, Last.fm allows songs purchased via download through partner stores such as the iTunes Store. 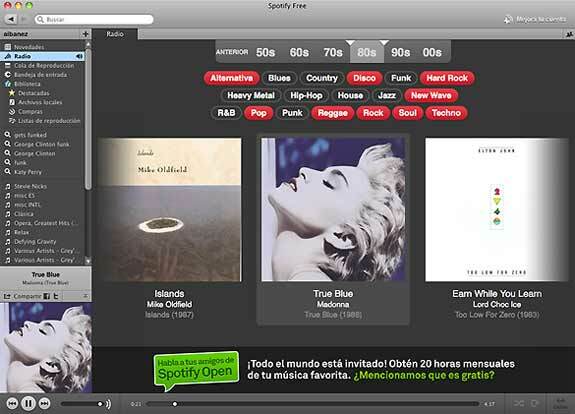 It is one of the most comfortable and stylish to use services, but their catalog is not as extensive as those of others, but includes artists and songs from Sony, Universal Records, among others, and you may find some Spanish music, especially in versions alternative (although this varies according to time). It is available in free version almost Limitations, although two premium modes also exist: a basic 5 euros a month without advertising and with CD quality and a 10 euros per month with access via mobile and via download if not have Internet access at a given time. 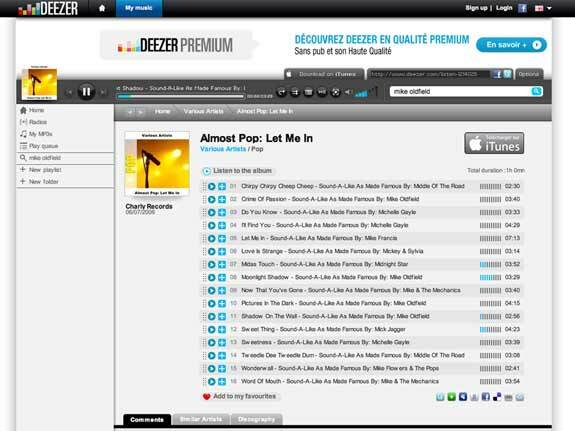 It’s another online music service but a little different, since it is aimed at artists who freely share their music. You will not find here a Madonna or Katy Perry. It is rather alternative artists who have created licensed their songs so they can listen online or download, as they are shared with a Creative Commons license that allows you to enjoy them and even use them to create remixes, for example in music videos or productions otherwise. It is an interesting place to discover new artists and also for new stars to showcase their music. 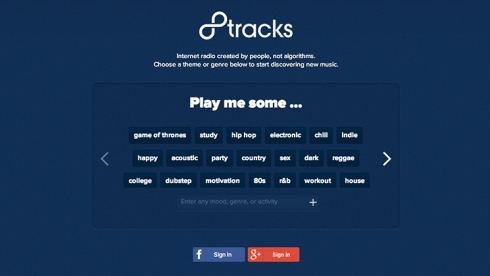 A site based on the principle of sharing playlists of other users, with at least 8 tracks. Equity research (and lists) is done by clicking on a keyword at the top of the screen. You can create a free account, but it comes with advertising. An “Eight plus” account is offered to eliminate advertising, $ 25 for 6 months (with satisfaction guarantee 14 days with full refund). There are many other sites like Gaana.com that streams new and latest music online in all languages. So make use of it and enjoy your music. This entry was posted in internet on Aug 17, 2014 by Rajesh.